I will preface this review with: yes, I am a fan. I had high expectations for what may be the series finale of Timeless. I had a long wish list of things I wanted from this finale. There is a little bit of fan entitlement in me, but also, from a writer’s POV, there were just stories from the past 26 episodes that I needed resolved. Because I also appreciate storylines reaching an organic ending, at the right speed, while being kept honest and even raw, there were aspects – fates, if you will – that I wanted either left open, or closed in ways some might perceive as less than positive. This fan, this clockblocker, got everything she wanted from this two-hour Timeless movie event – and more. My expectations couldn’t have been higher, yet I was left even more in love with this show and even more in awe of this writers’ room. As always, Timeless opened my eyes wider to history, filled my heart with more love, and made my soul feel lighter. Never, in all my years as a viewer, have I loved two hours of television as much as this - or cried so hard as many times as I did. Yes, some of those tears were from a place of sadness, but most came from a good place. A grateful place. “The Miracle of Christmas” is a festive jaunt through time, and, in allowing the creation of these two hours to occur, NBC has given fans the loveliest of gifts. It’s a gift that will warm you like mulled wine, and it’s just a little bit spicy too (of course I’m talking ships here. Agent Christopher has a dirtier mind than you expect). By the end, you’ll find yourself intoxicated by the joy zinging through your bloodstream from what is simply fantastic TV. Having said that, should this be it, should this be the very last adventure the Time Team goes on, this ending is what the show, and the fans, deserve. It is perfect. Those who have never watched before will find that on Thursday night - Dec 20th at 8/7c on NBC – this family of time travelers will leave a door open so newbies can slip into the bunker and fall in love. The “previously on” is unlike anything Timeless has done before and ensures even the newest of viewers will have enough knowledge to embark on this journey. If this is you, please join us. Between the mothership and the upgraded lifeboat there are plenty of seats for all. Are there nods to the fans? Of course. Emma drops one, and so does Rufus. Plus many more. The whole two hours feels like a thank you to the community of Clockblockers. It isn’t all happiness this Christmas. 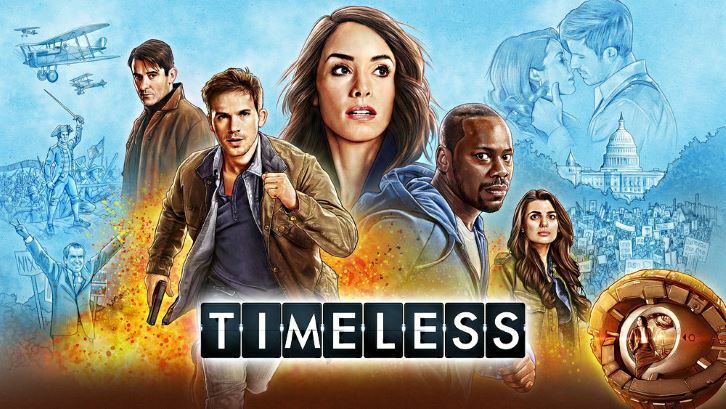 Timeless stays true to itself by keeping some endings open, and allowing some to resolve in what is simply the best fit for that character. It feels like each one gets the right ending, and while I may have wished better for some, I accept the way the timeline should be. Make of that what you will. Timeless also stays true to itself by continuing the trend of introducing us to women and people of color. And, in a reference to this, Lucy speaks a line near the end so perfect you won’t be able to keep the smile off your face. “All that we have between us is a past that only we remember." There will be death. There will be new life. There will be sadness, and joy, and hope, and love.